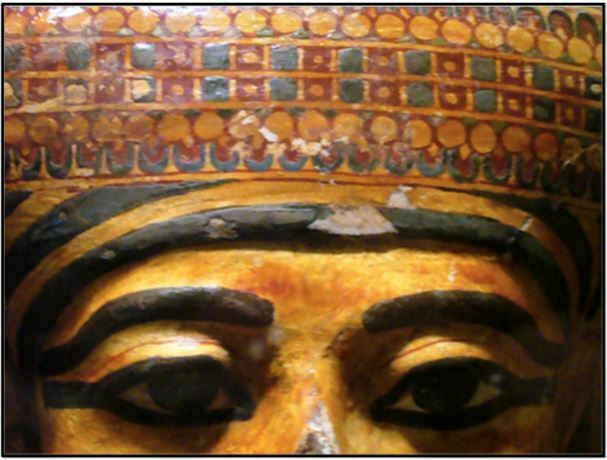 Egypt Burial Practices - HISTORY'S HISTORIESYou are history. We are the future. What did the ancient Egyptians believe about the afterlife? A great deal of what we know about ancient Egypt comes from what archaeologists learned by studying their tombs. A tomb is a place in which you are buried when you die. The ancient Egyptians believed that life did not stop when you died. What you did when you died was move away to another place, a place the ancient Egyptians called the afterlife. The Egyptians were likely the first to believe in an afterlife. At least they were the first to record their thoughts about the afterlife in such great detail. And, they went to great lengths to make sure that one's passage to the afterlife and existence there was pleasant. The Ancient Egyptian Afterlife: Ancient Egyptians believed in an afterlife, a wonderful place in which they lived and played after they died. To achieve immortality, though, there were a few requirements. You had to have your name written down somewhere, the more places the better. The ancient Egyptians believed that you disappeared​ if your name was not written down. You had to pass the weighing of the heart test in the Hall of Maat. Your heart was weighed against the weight of a magic feather. If your heart was light, because you had lived a good, hard working, caring life, the scale would balance, and you would go to heaven. If the scale did not balance, Ammit the crocodile-headed devourer god was awaiting you. Another thing you needed to move on to the afterlife was a preserved body. One way to preserve the body of a person who had died was to dry them out and wrap them up with linen bandages. That process was called mummification. Why dd the ancient Egyptians practice mummification? An image on papyrus of the Ba returning to the body. ﻿​The Ba and the Ka: The ancient Egyptians believed that everyone had a soul. They called the soul by two names - the Ba and the Ka. After you died, the ancient Egyptians believed that the Ba returned during the day to live with the family. The Ka flew off to live in the afterlife, which they believed was an actual place, a very nice place. At night, both the Ba and the Ka flew home to sleep in the body inside its tomb. If something happened to your preserved body, the Ba and Ka would get lost, and you would disappear. The Egyptians knew that the best way to preserve a body was to mummify it. Everyone, pharaohs and peasants, wanted a happy afterlife. In the beginning, in the very early days of ancient Egypt, the dead bodies of peasants and laborers and other non-noble people were laid out in the hot sand of the desert, which preserved them naturally. After the dry heat of the desert mummified their bodies, they were buried in graves with trinkets and toys and other things they would like to have with them in the afterlife. Mummy Makers: As the ancient Egyptians learned more about medicine, they learned how to mummify a body without setting it out in the heat of the desert, where wild animals might destroy it. The pharaohs, and those who could afford it, soon had the ability to hire professional mummy makers. However, it was very expensive. Mummy makers charged a lot of money. It's estimated that 95% of Egyptians could not afford to have priests prepare and mummify the body. Those Egyptians were, instead, buried in pits. Those who could afford it, however, were glad to pay the tab. They wanted to look their best in the afterlife. The process of getting a body ready for burial took about 70 days and included several steps. Ceremony (Canopic Jars): The first step of a professional mummification was the ceremony. 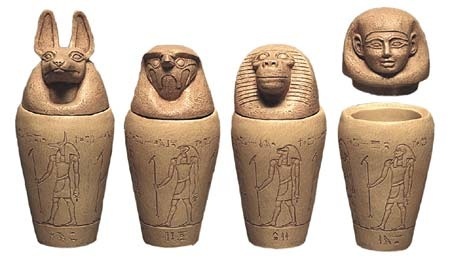 Four priests, one dressed as the jackal-headed god, Anubis, removed the inner organs of the body and placed them in canopic jars like those pictured above. Canopic jars were used to store organs. Each jar was protected by one of the four sons of the god Horus, and the lid of each jar was in the shape of the head of one of Horus's four sons. The jars were placed in a special chest, and stored in the tomb, next to the body. The priests removed the brain by using a hook to pull it through the nose. Then, they threw it away. The heart, however, was left in the body. Natron: After the organs were removed, the priests packed the cavities left behind after the organ removal with linen cloth and natron. Natron is a kind of salt. Using natron helped remove fluids from the body and acted to stop decay. 40 Days: After packing the body with linen and natron, the body was placed on a tilted slab. Then, the entire body was covered with natron to remove moisture in the skin and any remaining body fluids. That process took about 40 days. Make Up: After 40 days, the packing of natron and linen was removed and the incisions were sewn shut. The body was rubbed with oil and fragrant resins. Nostrils were stuffed with wax. Pads were placed under the eyes and make up was applied. After makeup was applied, the first strips of cloth were wound about the body. Decorate: Good luck charms, like ankhs, were tucked into the 20 layers of cloth that were wrapped around the body. An ankh is the ancient Egyptian symbol meaning “life.” It is shaped like a cross, but with a closed loop forming the top portion. If you were wealthy, good luck charms were made of precious jewels, ivory, and semiprecious stones. Jewelry was used to decorate the body as well. Mask: The face was covered with a specially created mask designed to look like the face of the dead person. The ancient Egyptians believed that the mask helped the Ba and the Ka to recognize their person when they flew back to the body at night. This process took about 70 days. After the mummification process, the actual burial could take place. Coffin: The mummy was placed in a coffin, or a series of coffins if the person was wealthy enough to afford more than one coffin. Coffins were quite elaborate. They were covered with written prayers to gods, and poems of praise, and with colorful illustrations. Procession: The first night of death, family and friends would bring the possessions the deceased had collected, and walk with the body and the possessions to its final resting place, the tomb. Family and/or professional mourners, wearing blue clothes, would wail and throw ash on themselves while the priests said prayers. Book of the Dead: At the tomb itself, the priests would gather and read from the Book of the Dead. This was not actually a book. It was a collection of papyrus scripts full of spells and magic incantations to ensure safe passage to the afterworld. Locking the Door: Finally, the mummy was placed in the tomb, and the door into the tomb was locked. Everyone went home. No one was supposed to enter the door again. Tomb robbers, of course, ignored this rule, as did priests if they felt the mummy of a pharaoh was in danger of being stolen or damaged. The mummy was wrapped with precious gems and amulets and jewelry. These were not only powerful pieces of magic, they were also worth a lot of money for their gem content. Moving the Mummy: After everyone was gone, the priests sometimes entered the tomb and moved the body to another place, a more secret place, to guard against robbery. The pharaoh needed his mummified body, of course, so that his Ba and Ka could return at night. Plus, the god-pharaoh needed to look after his people here on earth. If he disappeared, he couldn't do that. Whether you were rich or poor, whether you hired professional mummy makers or simply had your remains laid out in the desert to dry, everyone in ancient Egypt spent time planning what their mummy would need after they died. The ancient Egyptians had fun planning what their mummy would wear. They enjoyed making the jewelry and amulets they would have someone use to decorate their body after death. Death was not perceived as gloomy or sad. Instead, it was an extension of their good life along the Nile.